This Quoizel Marblehead 1 light medium outdoor wall lantern in palladian bronze finish with seeded glass is rated IP44 and features arched window design and clear seeded glass shade. Boasting a detailed stepped wall mount, short arm and medium top mounted circular lantern in palladian bronze; featuring a brimmed domed roof and arched window like panels fitted with a clear seeded glass shade for a twinkling light. Part of the coastal collection of exterior lighting, created to handle extreme locations and an ideal candidate for any home exterior whether of modern or traditional decor. Classic yet subtle styling and an impressive warranty make the Marblehead outdoor lantern a welcome addition to the coastal collection. The rich masculine design and stately form of the arches gives the clear seeded glass a window like appearance. Made from a new weather resistant outdoor composite material and featuring a 5 year warranty it is sure to stand the test of time. If you are searching for quality outdoor lighting in a classic style, this fitting should be considered. Fully weatherproof and supplied with a manufacturer’s 5-year anti corrosion warranty, which relates to the corrosion of finishes on outside lights like this one. Exterior fittings must have an IP (Ingress Protection) rating which indicates the fittings ability to prevent solids and liquids penetrating the enclosure. The higher the number, the greater the protection. The minimum rating for an outside light exposed to the weather is IP23. This fitting is rated IP44. There are matching fittings available that includes a small wall lantern and flush porch light; please see below. This exterior light is supplied by Elstead Lighting and designed in the USA by Quoizel, founded in 1930 in New York. 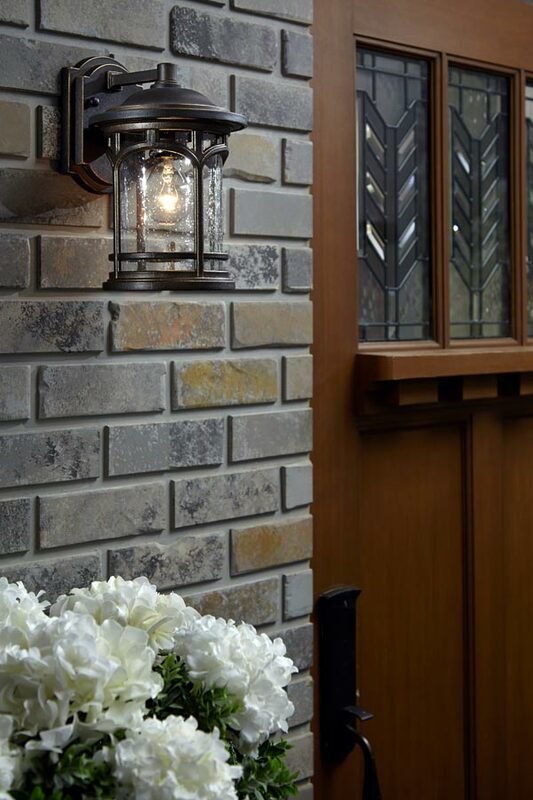 Their designs embody a history of being artisans in glass and natural materials that illuminate your living space and enhance the beauty of your home, such as the Marblehead 1 light medium outdoor wall lantern in palladian bronze finish with seeded glass featured here.